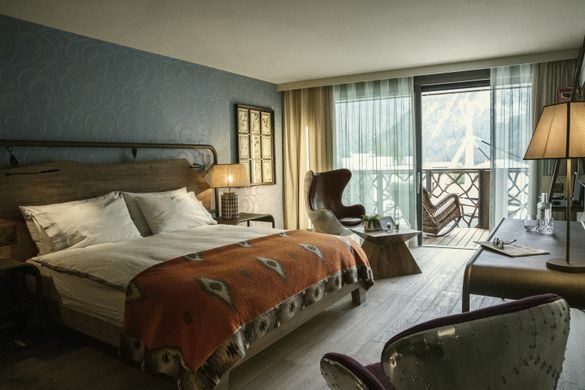 Valsana Hotel, Arosa, Switzerland, celebrates its first anniversary and re-opens for the ski season on 7 December 2018. After a successful first year Valsana, which is an eco-powerhouse running on recycled energy, has limited its ecological footprint to just 4% with virtually zero emissions and remains completely carbon-neutral. Almost all the heat needed for the property is generated, stored and recirculated using waste heat and ground probes with the aid of the site’s own ice battery. As a result, no oil or gas is needed. The eco philosophy runs throughout the hotel from the chunky wood furniture, floors and exterior, all made with trees from the surrounding area and the cladding of the previous property. Even the beds are eco-friendly – the mattresses are made from natural coconut fibres. Restaurant Twist has a light and holistic approach to Swiss mountain cuisine with a focus on seasonal local produce. Valsana Hotel’s relaxed atmosphere is reflected in the creative food concept, guests can choose from a choice of plant-based bowls with the option to add fish or meat. Located in the charming Swiss alpine village of Arosa, Valsana Hotel is just steps from the main cable car at an altitude of 1,800 metres and has easy ski-in access. Alongside the 225km of slopes, other winter activities include snowshoe hiking, Nordic walking and 4.7 kilometres of winter sledge runs.Apartments, Arosa (www.valsana.ch/en, T. +41 81 378 6363) has rooms from CHF 420 per night based on two adults sharing on a b&b basis.